The Advent and Christmas rush means I’ve missed posting several sermons lately. Hopefully, I’ll post them soon, even though they will be rather ‘after the event’. At least they will be present here then nearer next December for those who search this blog and others for relevant sermons. 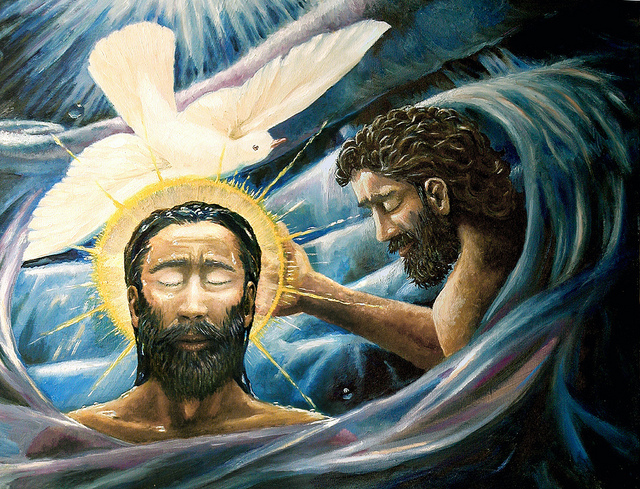 In the meantime, here is a sermon for this coming Sunday, when we mark the baptism of Jesus. Baptism Of Christ 10 by Waiting For The Word on Flickr. Some rights reserved. If you follow the movies, you may have noticed that in recent months Hollywood has had a bit of a religious obsession. Much of it has been poor, or at least contentious. God’s Not Dead caricatured atheists, Left Behind took up some dubious fundamentalist theories of the end times based on a questionable series of Christian pulp fiction novels, and Noah divided opinion. Now Ridley Scott’s Exodus: Gods And Kings has caused a stir. Not just because any such film is bound to provoke polarised opinions (and that’s just in the church! ), but because Scott engaged famous white actors to play dark-skinned Egyptians so as to generate box office income. And that’s before we get to the controversies about whether the script took liberties with history and scholarship. But Hollywood hasn’t usually worried too much about the choice between truth and a juicy story. Coming from a family where my grandmother was a friend of Gladys Aylward, I am only too aware how furious Aylward was with the fictional romance that was invented for the film about her life, The Inn Of The Sixth Happiness (never mind the dubious morals of Ingrid Bergman, who portrayed her). Let me come back to Exodus, though. Because Mark’s account of John baptising people, including Jesus, has Exodus themes in it. I’ve said before in sermons that the Jewish people of Jesus’ day commonly regarded themselves as being in a kind of exile, even though they lived in their own Promised Land, because they were occupied by Rome. So they longed for freedom. And as well as a theme that was like the liberation from Babylon, the Gospels also contain the imagery of freedom from their original place of captivity, Egypt. The Good News that Mark is beginning to tell is couched at the beginning in Exodus language. Our problem is that we are so used to hearing these stories in the light of more recent Christian debates and themes that we miss this. Perhaps we hear the baptism stories and start thinking about what we believe about baptism. Is it for infants, or is it for committed disciples? But we need to return to the Exodus theme. ‘Exodus’ is a Greek word. It is usually taken to mean ‘departure’, and so the second book of the Old Testament narrates the departure from Egypt. ‘Exodus’ as a word is a compound of two other words – ‘ek’, meaning ‘out of’, and ‘hodos’, meaning ‘road’ or ‘way’. This is the road or way you take out of somewhere. It is the escape route that you follow. And so an Exodus theme is a freedom theme. It is about liberation and liberty. I want to explore the baptism of Jesus, then, and its implications for us, under this theme of ‘freedom’. 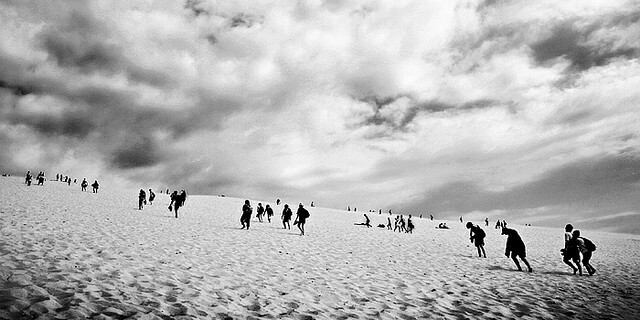 Exodus By Giorgio Raffaelli on Flickr. Some rights reserved. It’s therefore strange that Jesus embraces John’s baptism. Why does he need to repent? Again, the other Gospel writers are more explicit about this problem, but Mark characteristically keeps his account brief. Jesus certainly identifies with the people. He is the One who will lead people out of slavery – not, in this case, the slavery of Israel in Egypt, but slavery to sin. As the Israelites came through the waters of the Red Sea (or Sea of Reeds) to freedom from Egypt and her powers, so Jesus leads his people through the cleansing waters of baptism to freedom from sin. This is the good news of Jesus’ baptism: the Messiah has come to lead his people to freedom from sin. It begins with confession and forgiveness, but it becomes a whole pilgrimage from ‘Egypt’ to the ‘Promised Land’, as that initial setting free becomes a journey in which God leads us into freedom not only from the penalty of sin but also into increasing freedom from the practice of sin, until one day, in the New Creation, we shall be free from the presence of sin. For Jesus, that journey will embrace what our baptism service calls ‘the deep waters of death’. His Red Sea will not only be the waters of the Jordan at John’s baptism, but Calvary and a tomb. But he will rise to new life and ascend to his Promised Land, promising that we will one day go with him at our own resurrection. This is Good News that says to us, life doesn’t always have to be like this. It doesn’t have to remain a catalogue of remorse and failure. There is hope. We do not have to hate ourselves, because God loves us to the point of offering forgiveness and new life. Thus begins our transforming journey, in a baptism that calls us out of Egypt and on the road of increasing freedom. It’s worth reminding ourselves of this from time to time. I am not saying that baptism is some religious magic trick, but I am saying that to remember our baptism is to remember the promises of God to forgive our sins, and the power of God to change us and ultimately all creation, too. It is a sacrament of hope, as well as of beginnings. 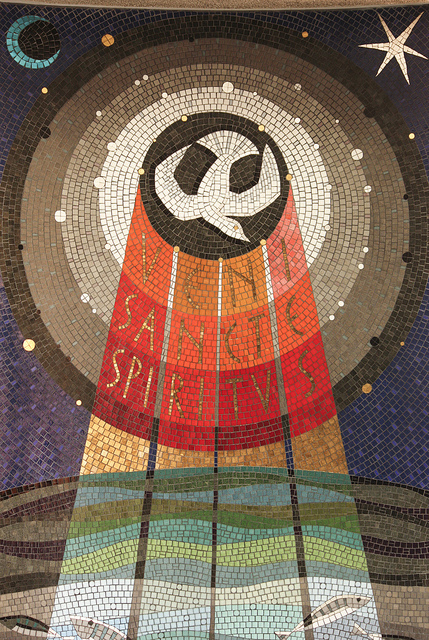 Veni Sancte Spiritus by Fr Lawrence Lew, OP on Flickr. Some rights reserved. What does this have to do with the Exodus freedom story? It’s about the manner of God’s presence. I’m sure you will recall that when Israel was being led through the wilderness, it was by a pillar of cloud by day and a pillar of fire by night. But now, in the New Covenant, God’s people get an upgrade. Not only will the presence of God (cloud and fire) lead them, now that same presence will come upon all of them and dwell within them. For you frequent flyers, they have effectively gone from economy class to business class. In Jesus’ case, there is something else. The descent of the Spirit upon him shows that he is the Messiah, for Messiah means ‘Anointed One’. He is anointed, not with the oil used to mark an earthly monarch, but with the oil of God, the Holy Spirit. We need not fear the gift of the Holy Spirit. He is the Spirit of freedom. ‘Where the Spirit of the Lord is, there is liberty,’ wrote the Apostle Paul. He brings God’s freedom to us, and empowers us then to be ministers of God’s freedom in the world. Through the Spirit’s work, we offer Christ and his liberating work to those in the chains of sin – the chains of their own sin, and the chains imposed by others upon them. And not for us the limited distribution of the Holy Spirit in the Old Covenant. Now the Spirit is given not only to a select number of God’s people, he is given to women and men, young and old, privileged and poor – anyone who desires to follow Jesus the Messiah, the leader of freedom. Those in higher church traditions than us have a liturgical symbol for this in the way the bishop applies anointing oil (‘chrism oil’) to the foreheads of candidates for confirmation. I came to like that tradition when I used to take part in ecumenical confirmation services with Anglicans, and concluded that we were missing out on that symbolism. I can offer something ad hoc, in that I possess a bottle of anointing oil, which has a beautiful smell of frankincense, and some people find it helpful to link the fragrant aroma of the oil with the presence of the Holy Spirit, who brings freedom. 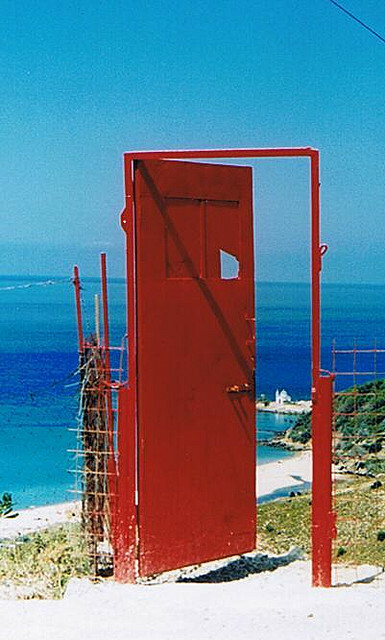 Door To Heaven by Tragopodaros on Flickr. Some rights reserved. And certainly that is a totally different reality in which to live. Think about God addressing Jesus this way. Mark hasn’t recorded any virtuous acts by Jesus yet at all. His baptism is his first action in this Gospel, and even that is done to him. There is not even a reference to the humility of the Incarnation in Mark. What, then, has Jesus done to earn his Father’s pleasure here? Absolutely nothing. But he hears the voice of unconditional love. God loves him and is pleased with him. Those of you who are parents, recall those times when you went into your children’s bedrooms at night when they were fast asleep. They might have delighted you that day, or they might have been utter pickles. But still you gazed at them and whispered words about how much you loved them. You had unconditional love for them. So ask yourself this: is God angry with me, or does he love me? Can I really believe the Good News that God delights in me? This is the liberating news of our New Testament Exodus. And that is a transforming insight. If God loves us like this, why do we not love ourselves? I don’t mean in a self-centred way. Rather, I mean something that the author Donald Miller has recently written about. In a booklet available online called Start Life Over, he lists five principles towards changing our lives for the better. The second of these is that – strange as it may sound – we are in a relationship with ourselves, so we should make it a healthy one. And it worked. I would find myself wanting to eat a half gallon of ice cream while watching television and I asked myself “if you skipped this, would you have a little more respect for yourself?” and the truth is I would. So I skipped it. And I had much more self respect. I suggest to you that this kind of transformation is open to us when we embark on our baptismal journey of freedom, in the power of the Holy Spirit, and hear God’s voice from heaven telling us we are loved unconditionally. It makes change possible. So often, the way we seek to promote change in ourselves and in others is through threat. We are no carrot and all stick. But all that produces is fear and paralysis. We might see some change, but it is the change wrought by sleeplessness and night terrors, rather than love. Ultimately, it doesn’t achieve much, and it affects us badly as people. God chooses the way of unconditional love to lead us into freedom. N T Wright, Mark For Everyone, p5f.